Notes: Turner E27. Butler Lydford Tor E Vol. 5. Map 29.17 (diagram Vol 5. p.197). Grinsell LYDFORD 41a Beardown Tors (N of). "The cairn, 4.5 metres by 5.6 metres and 0.4 metres high has spread over the remains of a contiguous kerb 4.6 metres in diameter." ... "Three of the cist slabs lean inwards at the top, the fourth, east slab remains upright. 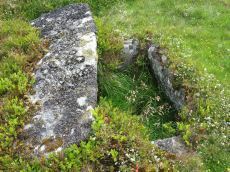 The bottom of the cist contains several slabs. 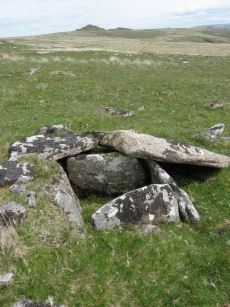 The coverstone is visible to the north west partially buried in the cairn." Lethbridge diagram p.107, photo top p.109. Notes: "Remains of a small cairn with cist on a moderate W slope in open grassland at SX 61407604 overlooking the West Dart in Crockern Newtake. It has been robbed heavily, leaving only one cist slab and fragments of the cairn material. The slab is restangular in side view and in section, firmly embedded on edge, measuring 1.2m long 0.48m high and 0.15m thick. It is aligned NW to SE." Butler Vol 5 p. 32. Lethbridge diagram and photo p.110. Notes: Turner E39. Butler Vol. 2. Map 29.18 (p.63, photo on p.124, diagram Vol. 5. p.196). Grinsell LYDFORD 41 - Crow Tor SW slope. "A kerbed cairn and cist. The cairn consists of a stony, turf-covered mound, and measures 4.5m in diameter and 0.45m in height. There are traces of a retaining kerb of leaning, granite slabs to the northeast and south. 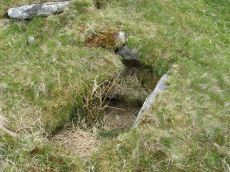 The cist is set slightly to the north of the centre of the cairn. It is trapezoidal in shape, and measures 0.65m and 0.95m in length, 0.8m in width, and 0.5m in depth. 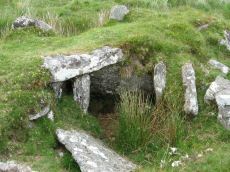 The cover-stone, which is 0.9m long, 0.5m wide and 0.2m thick, is displaced and lies just to the south east of the cist." Lethbridge diagram p.107, photo bottom p.109. 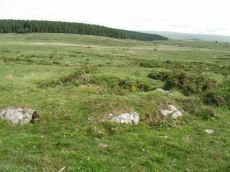 Notes: "A Late Neolithic stone alignment on Higher White Tor, surviving as two parallel rows of stones aligned roughly north-south. The alignment is 95.4 metres long and contains twelve upright stones and 24 recumbent ones." Lethbridge diagram and photo p.110.